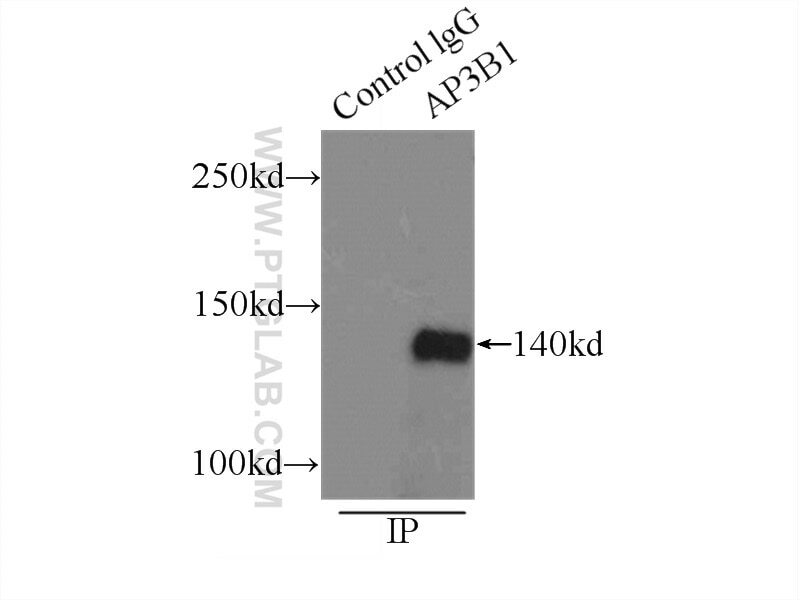 IP Result of anti-AP3B1 (IP:13384-1-AP, 3ug; Detection:13384-1-AP 1:500) with COLO 320 cells lysate 2500ug. AP3B1 is the 140-kDa β3A subunit of the adaptor-related protein complex-3 (AP-3), a ubiquitous heterotetrameric complex that is localized to the trans-Golgi network and endosomes and is involved in protein trafficking to lysosomes or specialized endosomal-lysosomal organelles (PMID: 9182526; 9545220). This complex is composed of two lager subunits (δ and β3A or β3B), a medium subunit (μ3A or μ3B), and a small subunit (σ3A or σ3B). The absence of the β3A subunit (AP3B1) results in the loss of stability of AP3 and leads to degradation of μ3A, to which β3A is directly bound, while the other subunits are variably affected (PMID: 16507770). AP3B1 contains three main domains: the N-terminal head domain, the hinge, and the C-terminal ear domain. It has been reported as a target of IP(7)-mediated pyrophosphorylation (PMID: 19934039). Defects in AP3B1 are the cause of Hermansky-Pudlak syndrome type 2 (HPS2) (PMID: 10024875; 16507770). BLOC-2, AP-3, and AP-1 proteins function in concert with Rab38 and Rab32 proteins to mediate protein trafficking to lysosome-related organelles. Matrix Proteins of Nipah and Hendra Viruses Interact with Beta Subunits of AP-3 Complexes. Misrouting of v-ATPase subunit V0a1 dysregulates lysosomal acidification in a neurodegenerative lysosomal storage disease model. Cellular and molecular defects in a patient with Hermansky-Pudlak syndrome type 5.